Sekondi March 24, GNA - Mr John Reginald Amihere, Western Regional Director of the Electoral Commission (EC), on Wednesday said reports reaching his office indicate that the voters registration exercise is going on smoothly at all centres in the Region. 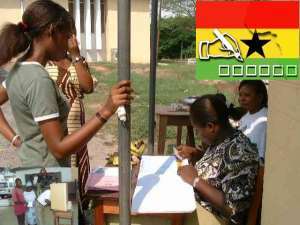 Speaking in an interview with the Ghana News Agency (GNA) in Sekondi, he said so far there had not been any reports of intimidation and harassment of registration officials from any quarters. Mr Amihere said Sekondi-Takoradi Metropolis and Tarkwa Township recorded the highest voters registration figures in the first week of the registration because of increase in population in the two areas but he did not give figures. Mr Amihere said the registration exercise did not take off on schedule at 14 registration centres in the Takoradi Metropolitan Area on the first day of the exercise because Registration Officers of the centres failed to collect the registration materials. He said the Officers did not give any reason for their action but it was believed it was linked to the demand for better remuneration that had been resolved by the EC. Mr Amihere said the Commission had to recruit new Registration Officers and train them to start the registration centres by the afternoon of the same day.